Located in the heart of the Bay of Plenty region of New Zealand’s North Island, 280km from Auckland, Kawerau is surrounded by spectacularly lush pine forest. Overlooking the town is MountPutauki (Edgecumbe), a dormant volcanic cone. You can climb to the summit of the mountain for stunning panoramic views of the town and surrounding landscape, as long as you get a permit. Kawerau is known for its friendly locals, celebrated Maori heritage and community spirit. 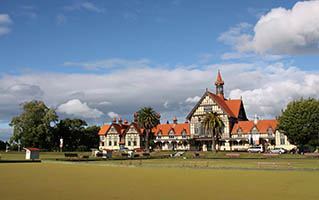 Grab a car and enjoy this beautiful part of the North Island at your own pace.